I’m really struggling to keep up with all the new restaurants opening in Pittsburgh. Part of it is I go to the same places once I find something I like and go there over and over again. The other part of it is I’m lazy and so many of them are opening on the opposite side of town from me. Actually having to make an effort is sometimes too much. Recently, I got an opportunity to kill two birds with one stone by going to Ki Pollo when I was going to an event in Lawrenceville. 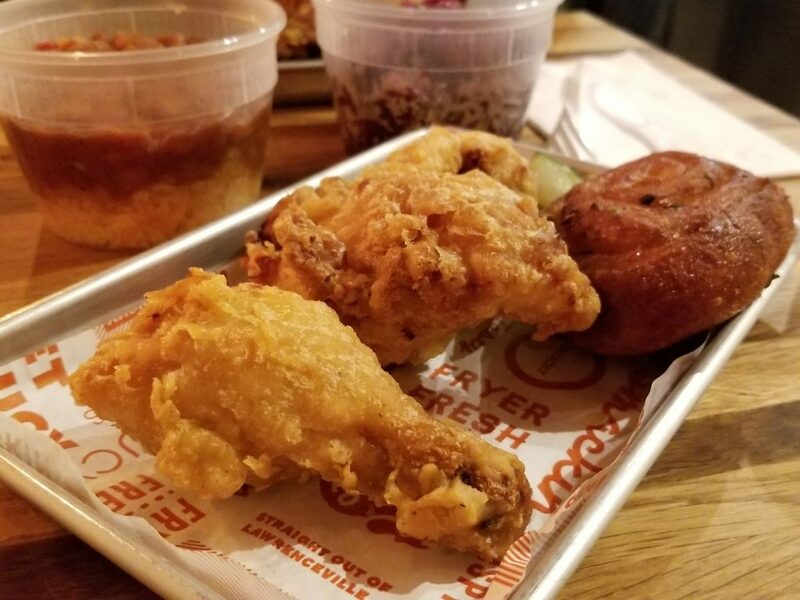 Ki Pollo is a new concept by the creator of Ki Ramen to introduce Korean fried chicken (aka KFC) and empanadas in a fast casual restaurant format. Definitely an interesting combination of foods, but it works. Upon walking in, it just looks like any other restaurant. A little bit of décor, but nothing very fancy. You order at the counter where the menu is painted onto wood planks for each item hanging on the wall. I felt that was a really cool touch because it made it feel like the menu was a part of the experience and décor. My brother was with me this time and I felt like we were ordering a large amount of food, and we probably did. We got 2 two piece combos which each came with a scallion bao and pickles, an empanada each, and sides of rice and beans and braised cabbage. All that food was considerably cheap for 2 people. We grabbed a table near the counter. We noticed right away the empanadas are baked right at the counter. It was nice to see that since many places would fry them instead, especially for a place with an industrial fryer. 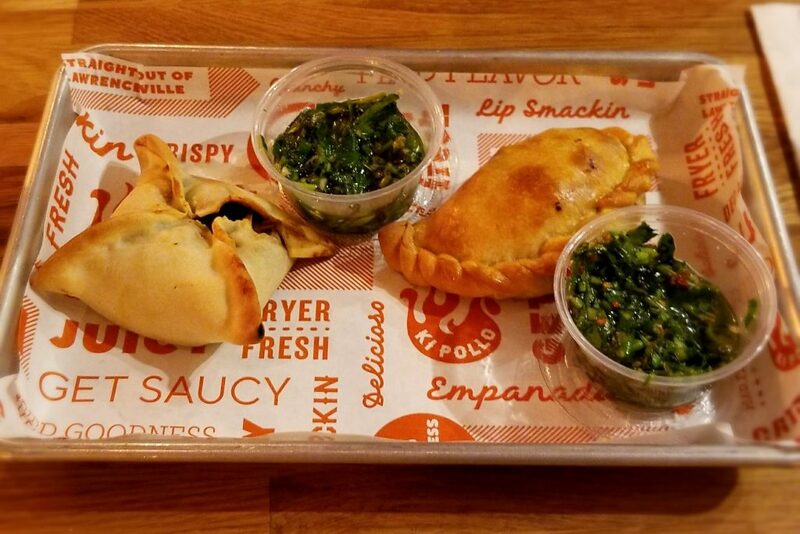 The empanadas were served with a side of chimichurri. I got the beef empanada, which was filled with seasoned ground beef, a full clove of garlic and a full olive. Then our meal arrived. Two trays of chicken with sides and two take out containers filled with rice and beans and braised cabbage. The chicken was hot out of the fryer. I don’t think I had ever had KFC before so this was a good experience. The chicken is thinly battered with just egg, flour and gochujang red pepper sauce mixed in. The chicken came out super crispy. 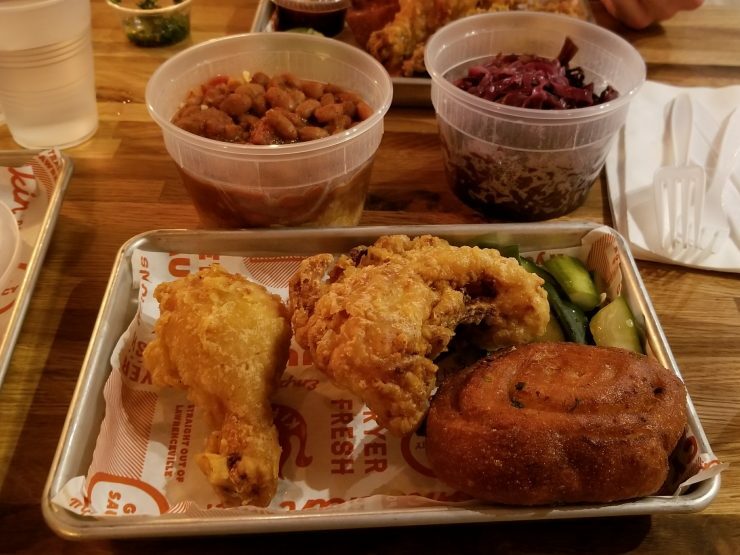 Biting into it, the chicken is full of flavor, still a little juicy and the batter sticks with the chicken giving it a good crunch as you chew. I’m generally more of a fan of white meat chicken, but the dark meat fried up much better. The chicken comes with your choice of sauces. I got the chimichurri again. My brother got the gochujang. I preferred the chimichurri as I like lots of garlic. The sides were also very good, but I would not suggested ordering more than one, if even any, if you are eating along. The rice and beans and the braised cabbage were both prepared well and accompany the meal well, but didn’t really blow me away. This isn’t to say they were bad. The sides were plentiful too. The scallion bao and pickles would have served as enough of a side for a regular meal. The bao is fresh, soft and hot. The pickles were cucumber spears and not pickled so long to make them sour. 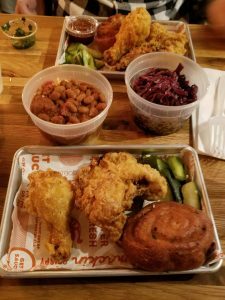 The bao and pickles along with the one empanada would have been enough as the sides. After all that food, I was very full. It was some of the best fried chicken I’ve eaten. Possibly in the top 5. The quality at the price is unbelievable. I might need to make the KFC and empanadas at Ki Pollo a regular food spot for me on my visits to Lawrenceville.